2014 Topps Triple Threads Football keeps the same format that collectors have come to expect, but with some design tweaks and updates. The high-end release includes two packs, or mini-boxes, per box, and six or seven cards per pack. Packs fall into two categories in terms of the contents. One version includes a Triple Relic card (#/36 or less) and Triple Threads Rookie Autograph Relic (#/150 or less), along with five base and base parallel cards. The other includes one Autograph Triple Relic (#/99 or less) and one Triple Threads Rookie Jumbo Relic (#/150 or less), in addition to four base and base parallel cards. Kicking things off with the base set, 2014 Topps Triple Threads Football includes 100 base cards and a variety of parallels. Collectors will find three base cards, numbered to 930 or less, in each pack. Also, one to two base parallels can be found per pack, including Purple (#/399), Emerald (#/199), Gold (#/99), Ruby (#/50), Sapphire (#/25), Onyx (1/1) and Printing Plates (1/1). Base Rookie Auto Relics utilize a design with square jersey pieces, as opposed to the circle pieces from 2013 Topps Triple Threads. The cards are numbered to 99 and include one patch and two swatch pieces, along with an autograph. Many parallels are available for the cards and include Purple (#/70), Emerald (#/50), Gold (#/25), Ruby (#/15), Sapphire Patch (#/10) and "White Whale" Patch Printing Plates (1/1). Onyx Silver Foil, Onyx Gold Foil, Onyx Silver Rainbow Foil, Onyx Gold Rainbow Foil, Pigskin Silver Foil, Pigskin Gold Foil, Pigskin Silver Rainbow Foil, and Pigskin Gold Rainbow Foil are all 1/1 parallel cards and feature a variety of memorabilia combinations. Triple Threads Auto Relics offer a similar layout to the Base Rookie Auto Relics, with an autograph, one patch piece and two jersey swatch pieces. Numbered to 18, these cards also come in Gold (#/9), Sapphire (#/3), Onyx Patch (1/1), Pigskin Patch (1/1) and "White Whale" Patch Printing Plates (1/1). Triple Threads Jumbo Plus Autograph Relics include a jumbo swatch or patch and are numbered to three. Letter Plus (#/3), Jumbo Plus Onyx (1/1) and Letter Plus Onyx (1/1) present additional parallel options. Triple Threads Auto Relic Pairs doubles the fun with dual autographs and relic pieces. The base version is numbered to 18 and parallels include Gold (#/9), Sapphire (#/3) and Onyx Patch (1/1). Triple Threads Auto Relic Trios combines the autographs and relic pieces for three players on the same card. The triple autograph cards are numbered to 27 and include Emerald (#/18), Gold (#/9), Sapphire (#/3), Onyx Patch (1/1), Pigskin Patch (1/1) and "White Whale" Patch Printing Plates (1/1). Not stopping at just three autographs per card, Triple Threads Auto Relic Double Combos feature six autographs and relics per card, with unique die-cuts. The cards are numbered to 27 and include Gold (#/9), Sapphire (#/3) and Onyx Patch (1/1) parallels. 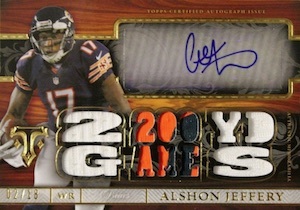 Rookie collectors are treated to more autograph cards with Triple Threads Rookie Autograph Relics. Numbered to 99, they can be distinguished from the Base Rookie Auto Relics because they only have one jersey swatch. Parallels include Purple (#/75), Emerald (#/50), Gold (#/25), Sapphire (#/10) and Onyx Patch (1/1). Hand-Stamped Autograph Cards, exclusive to Triple Threads, brings the rookie class even closer with hand-stamped jumbo cards and on-card signatures. These oversized cards are each numbered to 25. Triple Threads Transparencies are a case hit and include jumbo rookie signatures on acetate. The clear cards are numbered to 65, and there are also Emerald (#/30) and Onyx (1/1) parallels. It wouldn't be Triple Threads without plenty of relic cards. Triple Thread Relics and Triple Thread Relic Trios both offer three relics and are numbered to 36. Purple (#/27), Emerald (#/18), Gold (#/9), Sapphire (#/3) and Onyx Patch (1/1) parallels are available. 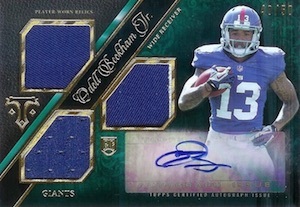 Triple Threads Rookie Jumbo Relics feature a jumbo jersey swatch and print run of 99. Purple (#/75), Emerald (#/50), Gold (#/25), Sapphire Patch (#/10) and Onyx Patch (1/1) offer additional parallel options. Finally, two rare one-of-one relics round out the product. 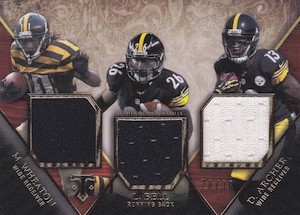 Triple Threads NFL Shields combine two relics and an NFL Shield Patch. Triple Threads Jumbo Patch Combos utilize a three-panel book card to showcase three players and three jumbo multi-color patches. 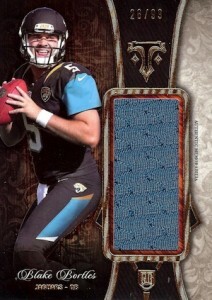 2014 Triple Threads Bortles, Lee and Robinson rookie triple patch 9 9 card JAGS! Good: Nice memorabilia options, Transparencies, all hits numbered, refined design and good stock. 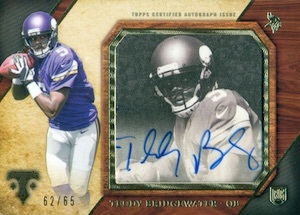 Bad: Odd relic die-cut nicknames on relics, sticker autographs, box price point does not match up with checklist. The Bottom Line: Topps did not really change much with 2014 Triple Threads Football, so those that are fans of previous years will likely enjoy this edition as well. Even with the more appealing design, the weaker checklist and sticker autographs don’t fall in line with the high-end pricing. 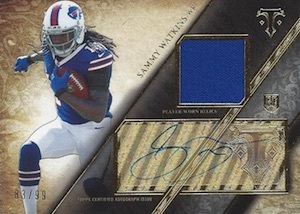 Brown may not seem like a great primary color for a base design, but it works in 2014 Triple Threads Football. The intricate background design, slight gloss and gold foil gives them a truly elegant look. The darker background makes the crisp player images jump off the card. Also, the numbered parallels add a faint splash of color without hurting the continuity of the design. Given that base cards are a majority of the 14-card box, the strength of the design is even more apparent. The remaining four cards are all hits and includes two relics and two autographed relics. Although I did not pull one, the Transparencies look especially good. 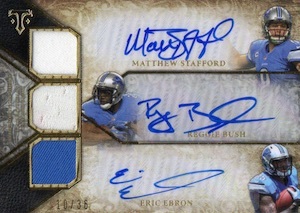 I personally like the design for the base rookie autographed triple relics. Fundamentally, they are very similar to 2013, but something about the squared relic windows and diagonal orientation works for me. I am less impressed with the rookie autograph relic design as it goes a little heavy on the gold foil and the single jersey piece seems very small. The “jumbo” relic included in the box was a little underwhelming as it was not really jumbo and was simply a basic one-color jersey piece. The final hit will be some version of the relic cards that feature random die-cut nicknames, initials, acronyms or expressions. I don’t think I have ever understood this particular feature of Triple Threads, but I imagine there are people that still enjoy them since Topps continues to include the concept. I did notice one peculiar thing while holding the stack of base and parallel cards in my hand. Apparently they are not uniformly cut, as all had different heights and widths and this was very evident when rested on a level surface. Not a huge issue, but certainly not something I would expect in a premium product. While many products go with unnumbered hits, leaving collectors to guess at the overall rarity, all the hits in Triple Threads are numbered under 99. In theory, this is a great thing. But given that many players have multiple versions in addition to several parallels, the total number is actually much greater than it initially seems. On top of that, this is another product that heavily features rookie subjects and there are quite a few possible pulls that might leave you scratching your head. It is also worth noting that although most of the subjects have two or even three cards in the primary rookie subset, each numbered to 99, Mike Evans, Odell Beckham Jr., Derek Carr, Kelvin Benjamin and others have only one card, essentially making them short prints. Value is a tough prospect for a high-end product that only yields two autographs laden with stickers, along with ten base cards and two relics. The potential is certainly stronger than other products, but so is the risk. Unfortunately, Triple Threads is is not an ideal place to find value on a box-by-box basis. All things considered, the card quality and design make the break fun. I also like that the cards are split into two mini boxes. It adds a little more time to what would be an even shorter break otherwise. Because the cards generally look good, the sticker autographs are that much more painful to see. Add in many one-color jersey pieces and a level of rarity that is not quite as rare as it seems, and things can sour quickly. Once again, how are you suppose to buy a product without a checklist available a day prior to release? Topps is really messing up this year. The card industry is killing itself. its crap just like almost all topps this year. overproduced and more stickers then a 2nd grade art class. low numbered what a joke! last year lowest rookie auto patch was to 36 this year its to 99 so that tells you how much more they made. they still keep putting guys like boyd and sam in their products which even pisses peopl off more cuz there two arnt even in the nfl anymore. throw this product on the scrap pile just like chrome. 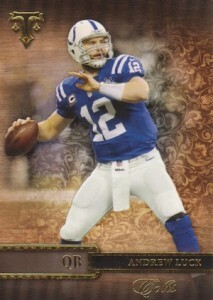 Ok Topps.. What are you doing this year? 3T was a solid product last year..
No more 3 different player mini patch relic cards. I like the fact that the triple relics I got was of just one player. Tons of redemption. Of 3 boxes, we got 4 redemption. In one box both redemption hits were of Jarvis Landry. Taj Boyd! AKA 2014’s Michael Egnew. Why oh why is he in a mid-season release…. Cut your losses with his garbage and stop passing it on to the consumer. How do you know what a TRUE RC is? Do they even exist anymore? I thought the card industry would’ve learned by now. They kill every innovation by cheapening it and running it into the ground. Inserts were cool until they made 20 different parallels a set so nothing has any value anymore. Auto’s were cool until they made them into mass produced stickers taking the collector one more degree from the player and making the cards feel disposable. Jersey cards were cool when they were game used and meant something instead of EVENT WORN jerseys the size of a tarp worn for 30 seconds for the purpose of reselling. 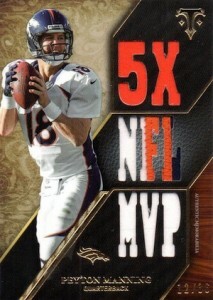 Next thing will be the athlete will simply handle a pile of the same card and that will be considered memorabilia. Give me a break. 2014 Topps Triple Threads Football Hobby Box - Factory Sealed!